The Spring sale of Asian Art at Sotheby’s France attracted a packed saleroom, and 20 phone lines with bids from around the world. 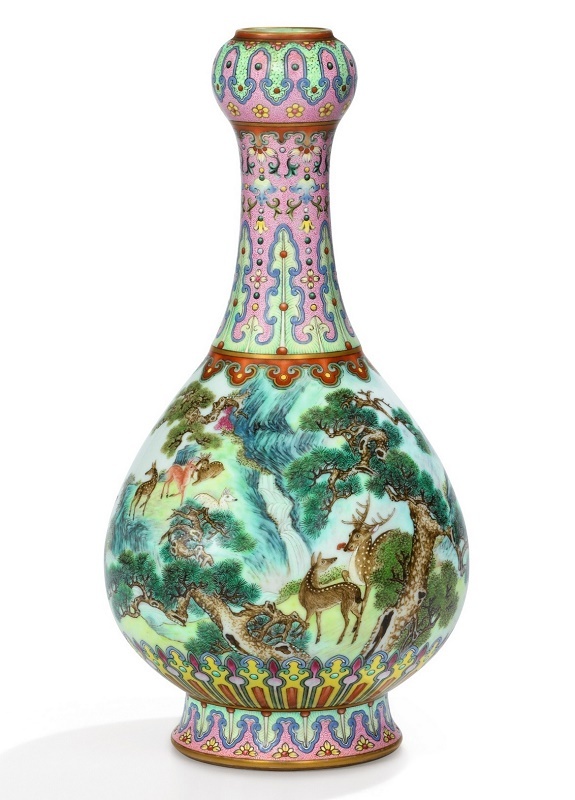 The sale got off to an explosive start with the auction record achieved in France by the extraordinary recently-discovered treasure of Imperial China: a unique Imperial 18th century ‘Yangcai’ Famille-Rose porcelain vase, bearing a mark from the reign of the Qianlong Emperor (r. 1736-1795). 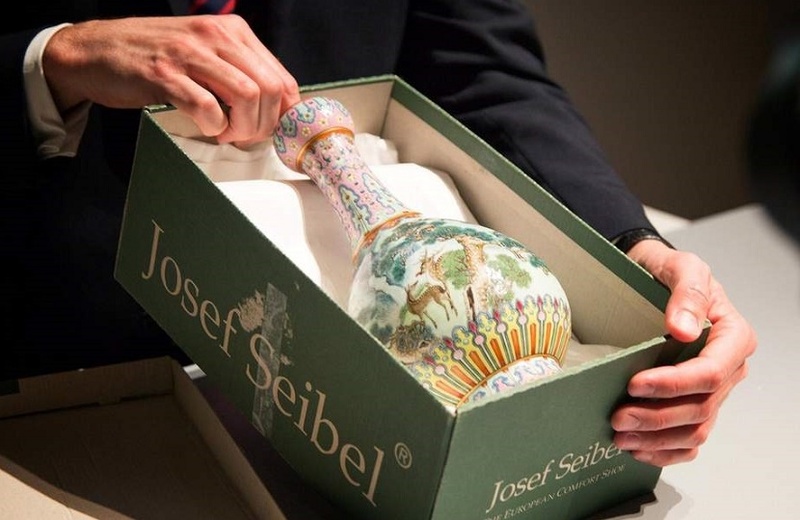 After a 20 minutes bidding battle, the vase was sold for €16.2 million ($19m / HK$ 149,5m) against an estimate of €500,000 – 700,000 (US$ 600,000 – 850,000 / HK$4.8-6.7 million). Discovered by chance in the attic of French family home, this magnificent vase was brought into Sotheby’s Paris by its unsuspecting owners in a shoe box. When Sotheby’s specialist Olivier Valmier, opened the box to examine the vase, he was immediately struck by its quality. Further research revealed the vase to be a unique example produced by the finest craftsmen of the time for the Qianlong Emperor. Left to the grandparents of the present owners by an uncle, the vase is listed among the contents of the latter’s Paris apartment after his death in 1947. It is recorded alongside several other Chinese and Japanese objects including other Chinese porcelains, two dragon robes, a yellow silk textile, and an unusual bronze mirror contained in a carved lacquer box. This mirror will be offered in the Sotheby’s sale of Asian Art in Paris immediately after the sale of the vase. While the exact provenance of the vase and the other Chinese and Japanese pieces before 1947 cannot be traced, the receipt of a Satsuma censer acquired as a wedding gift in the 1867 Universal Exhibition in Paris by an ancestor of the family suggests an active interest in Asian art at a very early date. Similarly, this vase may well have been acquired in Paris in the late 19th century when the arrival of Asian works of art initiated a fashion for Japanese and Chinese art. Interestingly, the only other vase of this shape and similar design, now in the collection of the Musée Guimet, Paris, was acquired by Ernest Grandidier (1833-1912) about the same time, around 1890 from Philippe Sichel, an Asian art dealer in Paris active in the late 19th century, and an early advocate of Japanese art in France. The vase is of exceptional rarity: the only known example of its kind, it was produced by the Jingdezhen workshops for the magnificent courts of the Qianlong Emperor (1735-1796). Famille Rose porcelains of the period (or ‘yangcai’ porcelains, as they are known) are extremely rare on the market, with most examples currently housed in the National Palace Museum in Taipei and other museums around the world. These so-called yangcai porcelain commissions were the very epitome of the ware produced by the Jingdezhen imperial kilns. They were made as one-of-a-kind items, sometimes in pairs, but never in 3 large quantities. This technique combined a new colour palette with Western-style compositions. Beyond their superior quality, yangcai enamels were intended to create the most opulent and luxurious effect possible. The vase, to be sold at Sotheby’s in Paris, has a body encircled by a magnificent landscape with deer, cranes and pine trees, all auspicious symbols of health and longevity: a genuine painting on porcelain showing nine fallow deer and five cranes in a rocky landscape with a tumbling waterfall, surrounded by gnarled pines and mist-covered peaks expressing all the artist’s dazzling talent. Only one other similar vase, although with slightly different subject matter and decorative borders, now in the Guimet museum in Paris, is known. This naturalistic garden most probably illustrates one of the Imperial parks designed for the Emperor’s delight. The scene may seem ordinary, but is in fact highly symbolic. The fallow deer, synonymous with happiness and prosperity, is often shown as the mount of the god of longevity. Cranes, personifying old age, also carried immortals through the air. Lastly, immortality is represented by lingzhi, mushrooms growing on the islands where the gods dwelt. The Imperial inventories drawn up in the 18th century mention pairs of vases with this design twice: one pair commissioned in 1765; the other ordered as a birthday gift in 1769.